Random House Books for Young Readers, 9780553533774, 336pp. 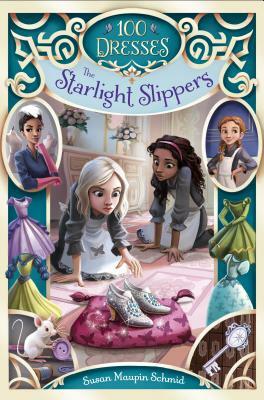 Fans of the Land of Stories and the Descendants series are sure to find the lighthearted fantasy-adventure of 100 Dresses a perfect fit! SUSAN MAUPIN SCHMID is the author of 100 Dresses: If the Magic Fits and Ghost of a Chance. When Susan was seven, she read Betsy's Little Star, a really old book about a girl who wants red shoes. Until then, Susan had only worn sensible brown shoes to school and toe-pinching black Mary Janes to church. Unfortunately, Susan's mother did not think Susan needed red shoes. She probably didn't, but she never stopped wanting pretty shoes. When she was a fifth grader, her mother sent Susan to the local shoe store to buy sneakers. And there in the window were grass-green Keds, just the same shade as the outfit she was wearing! Susan had to have those shoes! So she bought them. And she was very happy, despite the fact that she had to wear them with everything--whether they matched or not. Susan is currently on the lookout for a great pair of turquoise sandals. To find out more, visit SusanMaupinSchmid.com and follow her on Twitter: @maupinschmid.